Molly Tansey’s Mayfair Café | Come Here To Me! Ah… the hidden layers of a city. The Gigs Place, the late night eatery on Richmond Street South closed down to some dismay recently. A contender for one of Dublin’s longest running restaurants it was 42 years young when it closed, having opened in 1970. But before the Gigs Place sat Molly Tansey’s “Mayfair Café” which occupied the spot from 1956 -1969. The building work being done on the building has led to the facade to be recently stripped back, revealing a shopfront from a different era. I’ve searched and searched online but can find very little about the place, only that it was run by a lady called Molly Tansey from 1956- 1969. Newspaper archives are throwing up nothing and I’ve Googled it to death. Any of our readers remember the place? I am very curious about the shop next door, Caroline Records. I think the history of the cafe is connected to the music shop. Keep us posted. “An experienced waitress wanted for small busy restaurant: no late nights or Sunday work. Good wages to suitable girl. Mayfair Cafe. 43 South Richmond Street”. This is all I could find on the Mayfair Cafe! I’ll keep looking and let you know if I come across any information. The “Mayfair” fascia board was only revealed a few days ago when they removed the existing frontage which said “The Gig’s Place”. 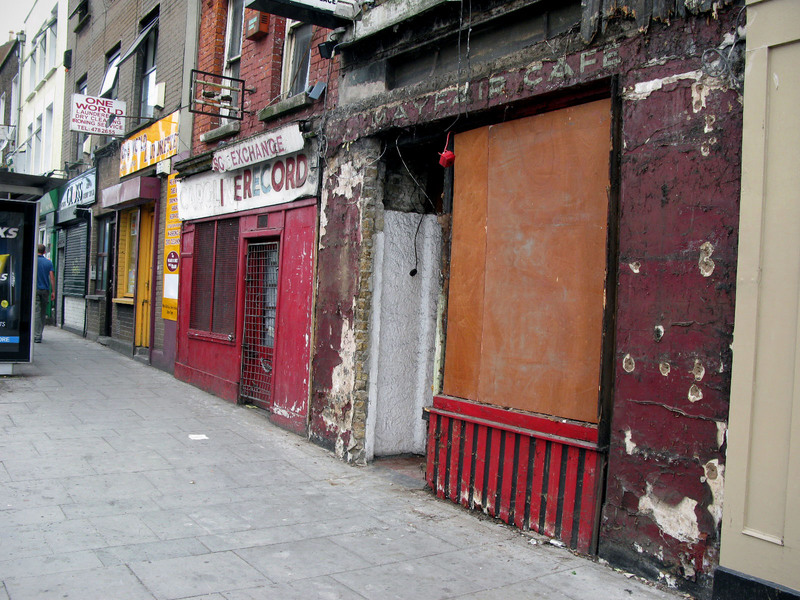 Both Caroline Records and The Gig’s Place were flourishing when I used to pass there in the early 1970s, but I think they both shut quite soon afterwards and remained in their dilapidated state for over thirty years. To me the two together were an icon of seventies culture and I’m sorry to see them go. Having written that, I have just read at the top of the page that the Gigs Place was open until a few months ago. That’s amazing! It always looked as tough it had been closed for decades. We went for a late night snack there just before Christmas, it looked like it hadn’t changed much since the seventies to be fair! Nice spot though.